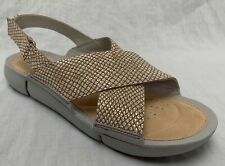 Pavers beige leather wedge diamante ladies mule sandals size 39 Uk 6. Only worn a handful of times last summer and have been cleaned. Pretty design with gold diamante. High heel but on a 1" platform so comfy and don't slip off! Happy to answer any questions. Heel of approx. Minimal wear to the soles or heels. They have been worn but are in very good condition. A couple of faint scratches/small scuffs on the backs of the heels but minimal. PAVERS RED SANDALS. SIZE 6 (39) GORGEOUS! HUSH PUPPIES SIZE UK 8 EU 42 BLACK LEATHER WEDGE SUMMER SANDALS. Dispatched with Royal Mail Signed For® 2nd Class. The shoes are in great condition. P RETTY NEW SANDALS FROM SOFTWAVES. WEDGE CORK EFFECT HEEL WITH SMALL PLATFORM SOLE. T BAR FRONT WITH SIDE BUCKLE FASTEN. NON SLIP RUBBER SOLE. Leather upper and sole, ideal for hot weather. Heel Height for Ladies Size 4 Shoe: 60mm. Buckle fastening. Regular fit. Product Style: Espadrilles. Brand new, never worn, Romika Grey Leather Wedge Sandals UK 5 EU 38. Genuine leather, soft and supple. Hook and loop fastening allows it to be adjustable. Check out my other items for sale, having a spring clear out! Dispatched with Royal Mail 2nd Class. Dream Leather Sandals by Fly Flot Size 3 in coral (red). Condition is Used. The tan part is suede leather, ankle strap as well is suede. Comfort without compromising style , lovely coral sandal that have great adjustments to fit your feet perfectly. Good condition. 2 velcro straps. Fly Flot logo on one strap. Anatomic comfort inner soles. Heel 2" Postage to UK only. Condition is Used small markings on the heels. Ladies ultra comfort soft leather wedge sandals, from the Footglove collection by M&S, UK size 6 wider fit. Super soft leather uppers in grey with buckle fastening. Thick cushioned leather footbed, non-slip outer soles and wedge heels are 2.5” high. Fab sandals by FOOTGLOVE. real leather upper sandals in brown. quality leather sandals with plenty use left. velcro fastenings. soft cushioned insoles. Size is UK 6 on label. Tan Wedge Sandles, Topshop , cross front , leather upper, 4” high, worn couple times . BioStep size 7/40 coral/beige/black flat leather sandals. Slight wedge 2cm. suede lined insole and rubber outer sole. Antique gold coloured buckles. NEVER BEEN WORN. Dispatched with Royal Mail 2nd Class. 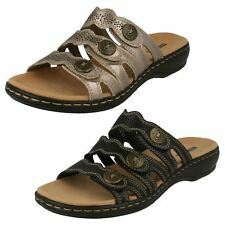 LADIES FLY FLOT RedLEATHER SANDALS/mules WOMENS UK SIZE 5, NEW,. Dispatched with Royal Mail 2nd Class. These sandals are from the softwear range. Few slight marks but nothing noticeable. M&S Wider Fit brown leather sandals. UK6 WIDER FIT. Comfortable foot bed. LORBAC Ladies Tan Beige Leather Strappy Heel Sandal Shoes Eur 39. Condition is Used. Dispatched with eBay delivery – Shutl 2-3 days. Yellow/Mustard Wedge Sandals CLARKS. Condition is Used. Dispatched with Royal Mail 2nd Class. Hardly used - in great condition. Clarks Womans Red Leather Sandals,size 6,wedge. Condition is Used. Buckle fasteners. R ed leather. Wo od effect a nd leather we dg e. Smart and clean.